As I sat there scrolling bloglovin and Instagram the other morning, I couldn't help but feel a few feelings. For some reason, all these ideas and feelings started swirling around in my head and I figured... why not share a little brain dump confessional. I don't have baby fever, but I'm super jealous of all the people having more babies. I don't know what it is about this. Maybe all my friends just have insanely cute babies which makes me want a smiley little one of my own? Or maybe it's all the amazing baby products that they have now? Or maybe the idea of being on maternity leave, taking early morning walks with a baby, and then enjoying the afternoon until we would have to get Mason is creeping into my brain? Or maybe it's just Instagram brainwashing me?? LOL. I don't know. I'm sure things would not be nearly as perfect as I imagine, but man social media makes it look pretty perfect. Don't get the wrong idea, there won't be any baby announcements over here any time soon (or likely at all), but it doesn't mean I can't swoon over all these cute, squishy baby photos I'm seeing. My want for a house, a REAL HOUSE, is getting stronger by the day. The more I see people sharing photos and as Christmas starts to roll around and people are decorating their mantels, I start to get jealous. Well, I guess continue to be jealous since I've been swooning over people's kids being able to ride their bikes around their cul-de-sacs and play in their giant backyards all summer. To be honest, I don't even know what I'd do with all that space, but to just not need to tell Mason to use quiet feet and watch the volume of his voice as well as just being so paranoid about being those "rude neighbors" (kind of like my current neighbors), would be worth it. My love for living where I do is strong, but the fact that it is SO expensive is really putting a damper on things. I really do love living here in Southern California. Between the weather, having family so close, having so much to do, having good jobs, a roof over our heads, etc, it is pretty great. However, the cost of living is insane. I probably pay more for our two bedroom apartment than half my friends do for their giant houses. It's a bit depressing to think about. And a bit depressing to look at what it costs to buy even a 1,000 square foot condo. But, I guess there are pros and cons to everything. I can't believe I am admitting this on the internet, but I'm not overly happy with my weight. Seth and I did a Whole30 in January 2015 and I felt like I was at my best weight and felt the best right after it. Things were going well in the months following and then... we took a cruise in October 2015 and it was downhill from there. The holidays hit, then 2016, then 2017 and it's been downhill ever since. Don't get me wrong, I didn't fall off the wagon and gain 100 lbs, but I just don't feel like me if that makes sense. I kind of want to do another Whole30 or something similar but I just keep coming up with excuse after excuse and then I buy a bag of dark chocolate peppermint at Target and I'm just not helping myself. I'm jealous of some people's giant groups of girlfriends. Girlfriends that get together for book clubs or supper clubs. Girlfriends that have scarf exchanges and earring exchanges. Girlfriends that have a 'moms night out' once a month. I have some great friends, but not a core group of girlfriends. And truth be told, we all have such opposite schedules that we're lucky to see each other once every other month, if that. I'd love to have a group of mom friends or neighbors or something that I can get together with and do stuff like that. I'm jealous of the carefree moms who drop their kids off at school and can do whatever they want for the rest of the day until they have to pick the kids up from school. Maybe carefree is not the right word, but I feel like I see so many moms that drop their kids off at school and then have all this free time to go to the coffee shop or go shopping or go work out or blog or do whatever. I'm sure social media not painting an accurate portrayal of what is really going on, but man, it sure looks perfect and relaxing. I'm baffled by how people have so much time on their hands. Am I just a hot mess or what? I swear I am busy ALL DAY. Sure I do waste time on social media during the course of the day or do some online browsing/shopping, but overall, I don't have tons of time. I'd love to blog more. I'd love to read blogs more. Heck, I'd love to read a book. I have tons on my wish list to do list that never gets done. I really want to look more in to essential oils and diffuser and roller bottle recipes. The list goes on and ON. And then I come across someone's Instagram post promoting their coaching business and they say "you have no excuses not to work out!" Umm. What? When do I have time for this? I already wake up at 5:30am to get ready for the day, then am at work the whole morning and majority of the afternoon, and then most of the time I'm taking Mason to swim lessons/doctor's appointments/ABA therapy, etc. Then it's dinner, bath time, bed time, and then I AM POOPED. I guess it all stems back to me working outside the home all day, if I worked at home or was a stay at home mom, I'd probably have a lot more time to do stuff (especially while Mason was at school), but that's just not our reality. Unfortunately I have just as many hours in the day as everyone else and most of those are booked for me. My apartment looks like a paper bomb went off. I would try to fix it but I have no clue where to put it all. Doctor's appointment papers. Mail. Papers sent home from school. Papers that need to be filled out and sent back to school. And the list goes on. WHERE DO I PUT THEM ALL? I know I need to go through the papers, but some need my attention and some I need to remember to bring to XYZ appointment and I just don't know where to put them all. Maybe one day I'll have a desk to keep me more organized... or a desk to pile the papers on so my kitchen counter doesn't look so cluttered. I really want to decorate for Christmas now. 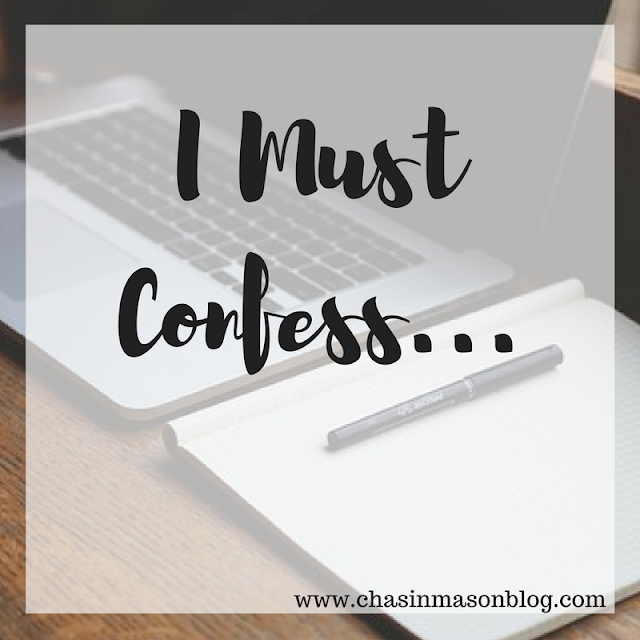 Can you relate to any of my confessions? I'm with you on a lot of these. I feel like I'm the only one of my group of friends who doesn't have a baby, which makes me not have a lot in common with them! Girl, there aren’t enough hours in a day. I have a stack of like 8 People magazines on my nightstand that I can’t even read because there is no time to read them! And I LOVE me some People! And I’m just now finding my core group of girlfriends as a mom, they do happen to be my neighbors that I’ve gotten to know over the last year or so after moving into the hood. I'm with you on so many of these. I'm sad sometimes knowing that there will be no more babies. I really loved maternity leave... And I'm with you on the girlfriends thing too. Sure, I get together with ladies every so often, but I wish I had a tight knit group of regulars. I will say Weight Watchers was really good for me. I've shared that before, but before I started it I was kind of at a hopeless point. Now I feel better. I still have squish but just not as much squish and I feel like now that I've dropped some bulk I can still enjoy the indulgences as long as I keep it under control. You can borrow Clark ANY TIME you need a squish fix ;) But seriously, I hear you on all of this. SM does not paint a realistic picture by any means and thats why I view it as an artistic outlet vs real life (does that make sense?) And I never get all my stuff done day by day and thats without working right now, such is life lol. I love brain dump confessionals. I have baby fever something fierce and Instagram intensifies that times a gazillion. We have three sets of friends that moved from CA to TX because of the cost of living. It breaks my heart that they have to leave home to be able to live. I pray that you guys find a home you love and that is reasonable! Or even better than reasonable. I’m right there with you with the weight thing. I did good and dieted for 3 months and then I got sick and just wanted comfort food! I need to get back on track. I’m so ready to decorate for Christmas as well. I just have to wait for the Christmas tree farms to open. Happy weekend! I had to laugh at this because I totally thought I’d have so much free time with Reed in school. I work from home, but surely I’d be browsing the aisles at Target leisurely when he is at school since my schedule is so flexible. Guess I forgot that I actually have to work in those hours. I think I’ve gone shopping without him like once since school started in August. I also thought I’d learn Spanish in my “free time”, yet I can’t even remember to do my 10 minutes a day in the Duolingo app. Free time...what is that?? So much truth here Liz! First come to Utah and get your baby fix with Kane! Then you’ll let be it so much you’ll move here and you can buy a big ol house! And then you can be in my book club! Really I just solved all your problems! I just nodded my head through ALLLLLLLLL of this. Let's start with the housing. GIVE ME A REAL HOUSE. Moving on to babies. I've been begging for a baby for.... MONTHS? But, when Scott and I sit down and say we think we're both on board, I'm like, "OMG, DO I WANT THIS?" Next. The friends. YESSSSS. Sure, I have some really great friends. But nothing like I pictured five, or even ten years ago. Lastly. I want to decorate SO bad (and totally agree with the Hearth and Hand collection), but the other adult in our house has a strict after-Thanksgiving rule. Lame.